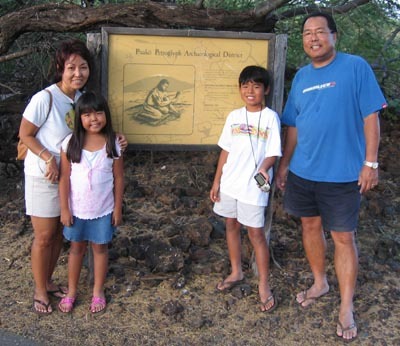 Took my sister’s tribe in search of the Petroglyphs Geocache in Puako. 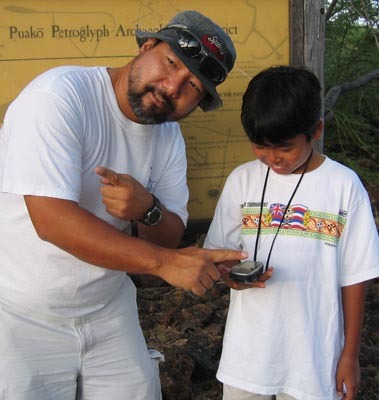 This would be their first geocaching adventure and, of course, the kids had thoughts of buried treasure on thier minds. I had been here before so I tried to stay out of the way, only lending guidance how to work the two GPS units I let them use. My niece found a hint at the site, my brother in-law actually found the geocache first and my nephew unearthed the cache itself. It’s really not that hard to find but you’d never find it without first having a GPS. 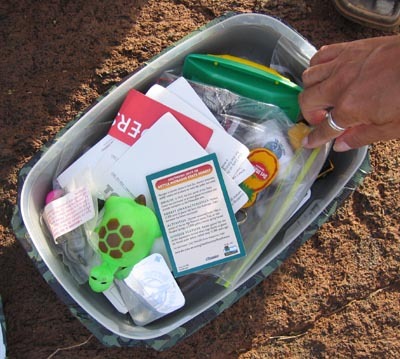 A look inside the geocache. 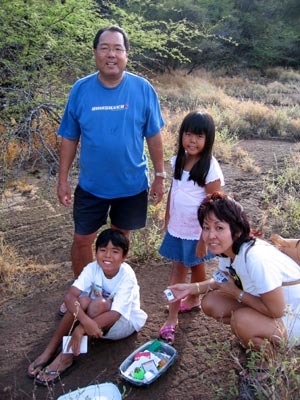 I had my niece and nephew pick out a couple of nice keychains up in Waimea at the Parker Ranch Store so they could trade if they found something they wanted in the Geocache. The usual rule is that if you take something you need to leave something. My niece took a nice Geocache Coin and left her keychain. My nephew prized the keychain I bought him more than the stuff in the Geocache, I wouldn’t let them take the Travel Bugs which they really wanted. Here I am giving my nephew precise directions on where to go next. All in all a great adventure for the kids. I think I got them hooked. The kids voted to go Geocaching again tomorrow in lieu of swimming in the Hilton pool which was surprising. More Geocaching adventures. We checked the Geocaching website for another cache near their hotel and most of the caches are kinda tough for the kids but we finally found an easy one. Expect an update tomorrow.